The double Academy Award-winning movie Ghost is a huge success story, both critically and at the box office, where it was the highest grossing film in the year of its release. It starred the late Patrick Swayze alongside Demi Moore and Whoopi Goldberg and was directed by Jerry Zucker. Bruce Joel Rubin's script won the Oscar® for Best Original Screenplay and Whoopi Goldberg won the Oscar® for Best Actress in a Supporting Role. The film's most iconic and moving scene was famously performed to The Righteous Brother's Unchained Melody, which also features in the musical version. 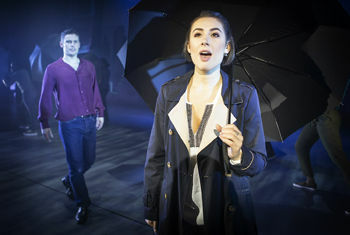 Rebekah Lowings (Joseph and the Amazing Technicolour Dreamcoat, Jesus Christ Superstar) will join Bill Kenwright’s production of this timeless story of love, despair and hope in the part of ‘Molly’ alongside Niall Sheehy (Titanic The Musical, Miss Saigon, Les Miserables, Wicked)as ‘Sam’. Sergio Pasquariello (Original London cast of Heathers the Musical, other credits include West Side Story, Les Miserables) plays ‘Carl’ alongside Jules Brown as ‘Willie’, James Earl Adair with hishaunting performance as the ‘Hospital Ghost’ and Lovonne Richards as the ‘Subway Ghost’. Jochebel Ohene Maccarthy plays ‘Louise’ and Sadie-Jean Shirley is ‘Clara’. Completing the cast is Chanelle Anthony, Josh Andrews, Samantha Noel, Charlotte-Kate Warren, Kage Douglas and Michael Ward. Tickets for GHOST THE MUSICAL are on sale at Bradford Theatres. Recommended age 12+. For more information or to book please call 01274 432000 or visit bradford-theatres.co.uk.